Let’s get a few things out of the way first. There’s a good chance Albert Pujols doesn’t earn out the $240 million the Angels will pay him over the next 10 years, at least not directly. Also, one player rarely turns a merely decent team into a title contender. But Arte Moreno’s big offseason splash wasn’t as simple as adding one player, even if that player is one of the best of his generation. The Pujols signing greatly upgraded a lineup that badly needed it. But inking C.J. Wilson to a five-year, $77.5 million also offered a substantial upgrade, even though the top of the Angels’ rotation already ranked among baseball’s best. Throw in Mike Scioscia finally relenting on playing a catcher with great defensive ability and a historic ability to make outs with his bat (with the Angels trading for Chris Iannetta to take Jeff Mathis’s place) and you have a roster that should be much improved over last season’s edition. Given the Halos were already contenders past Labor Day last season, it’s no surprise they’re a popular pick to … well, be a title contender. That Bill James projection for Iannetta looks Coors-ified; it would in fact be the best season for the walk-happy catcher since his monster ’08 season (.391 wOBA) with the Rockies. Iannetta’s home/road splits are actually terrifying: .281/.391/.549 at Coors Field, .171/.308/.300 everywhere else over the past three years. That doesn’t mean we should expect his offense to crater, but the Angels probably aren’t getting the Colorado version of Iannetta either. Several other variables are also in play. The Angels very nearly traded Bobby Abreu to Cleveland before the deal fell through. For now, he’s a candidate to claim a chunk of playing time. Mark Trumbo posted an ugly .291 OBP last year, but also slammed 29 homers; he’ll need to play too, possibly taking playing time from Alberto Callaspo at third. Vernon Wells is penciled in as a starter; he’s also coming off one of the worst offensive seasons ever recorded by a starting outfielder. Morales taking the field on Opening Day would mark the first time he’d have appeared in a regular-season game in nearly two years. Meanwhile, consensus top-three prospect Mike Trout waits in the wings, a call-up away. It’s not an optimal collection of players by any means. But the Angels do have multiple options. In what figures to be a tight race for AL West supremacy (and the two wild-card slots, for that matter), having contingency plans is a good thing. So too is having an elite defense. The Halos ranked fifth in 2011 for team UZR and may well be better this year: Pujols has been a plus defender his entire career, and a Trout call-up could give the Angels two Gold Glove-caliber fly-ball catchers in one outfield, with Trout supporting the human vacuum cleaner that is Peter Bourjos. You can count the number of rotations with three projections that strong on one hand. Wilson’s signing offers gives the Angels the added benefit of poaching their chief rivals’ staff ace (see also: trading Mike Napoli for $84 million worth of Vernon Wells, then watching Napoli hit like vintage Mike Piazza … only the other way around). The Halos do still have a potential weakness with Jerome Williams slated to be the fifth starter and no evidence beyond 44 innings of a low ERA, unsupported by anything resembling strong peripheral stats, to suggest he’ll do well with the job. There’s even potential good news on that front, though: The Angels probably won’t need a fifth starter until April 15 with all the early-schedule days off, and Williams’s current hamstring injury might prevent him from making that start. Not that you’d ever wish an injury on anyone … but simply handing the job to top prospect Garrett Richards from day one is likely the wisest decision here, however it has to happen. A more pressing potential concern is the Angels’ bullpen, which ranked 26th in the majors in FIP last season. The bad news is that the pen isn’t all that good after the righty-lefty combination that typically handles the late innings. The good news is that combo, rookie closer Jordan Walden and his sterling K rate of 10 strikeouts per 9 innings and veteran ground-ball specialist Scott Downs (sky-high 63 percent GB rate) both sparkled last year, and could produce strong results again this season. 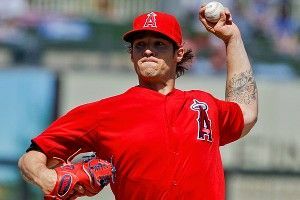 Considering the top four starters in the Angels’ rotation figure to pitch deep into games often, the team can probably survive with a relatively thin pen for a while, or at least until Moreno gets the urge to push the rest of his chips into the middle of the table for this all-in season. Trout. Basically a default pick, since the Angels’ roster is overloaded with established veterans, and I don’t expect Trout to get to the majors for at least a few more weeks, nor to put up big numbers as a 20-year-old. But he’ll make a good Angels team even more exciting, make some spectacular plays on the base paths and with his glove, and start to fulfill some of the offensive promise that makes him a true five-tool prospect. The Angels win the AL West, then vie for a spot in the World Series. The additions of Pujols and Wilson alone could add six to eight wins to last year’s ledger, and the Rangers’ spring injuries and regression candidates (led by, again, Napoli) make them vulnerable, albeit still formidable. Pujols and a great top-three group of starters can’t mask the multiple weaknesses in the rest of the lineup, or the lack of depth in the bullpen. The Angels could still contend for a playoff berth while still catching a bunch of bad breaks. But the AL’s elite group of six will likely include the Angels, Rangers, Tigers, Yankees, Red Sox, and Rays. One of those teams isn’t going to make it to October, even with the addition of another wild-card spot. Are We Sure That Bill Parcells Is the Right Guy for the Saints?